Pilot whales are so named because it was once believed that each observed group was navigated by a pilot or leader. Their Latin name, Globicephala, means ‘round head’, which is one of the main identifying features of the species. The bulbous head and thick curved dorsal fin become even more pronounced in adult males, who become easy to distinguish from females and juveniles. While normally oceanic in their distribution, pilot whales can also approach coastal areas, and are frequently seen on whale watching tours around the world. They are rewarding to watch, as they are generally approachable and impressive in size and behaviour. There are two species of pilot whales: Short finned pilot whales (Globicephala macrorhynchus), which are mainly found in tropical and warm-temperate regions, and long-finned pilot whales (G. melas), which inhabit colder waters and are further subdivided into three sub-species: the Southern long-finned pilot whale (G. m. edwardii), the North Atlantic long-finned pilot whale (G. m. melas), and the now extinct North Pacific long-finned pilot whale (G. m. un-named subsp.)1. 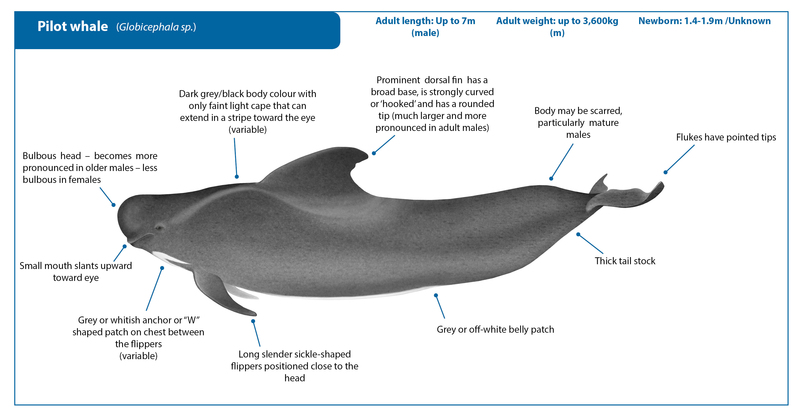 DOWNLOAD THE PILOT WHALE A4 FACT SHEET HERE. Short finned pilot whale. Note the bulbous head after which the species is named. Photo courtesy of Paula Olson. Short-finned and long-finned pilot whales are almost impossible to distinguish from each other at sea in the few places where their ranges overlap (South Pacific, North Atlantic; off the coast of South Africa; and off of southern Brazil, Uruguay and N. Argentina). Although the two species’ flippers differ in length and shape, these differences are difficult to observe at sea, and differences in skull shapes are one of the only certain ways to distinguish one species from another where they overlap2,3. Pilot whales can also be confused with other ‘blackfish’, including false killer whales, pygmy killer whales or melon-headed whales, but none of these species has the bulbous head or rounded hooked dorsal fin that is characteristic of adult pilot whales. These other species’ dorsal fins and flippers are also located further back on their bodies than those of pilot whales. Long finned pilot whales off the coast of Italy. Photo courtesy of Chris Johnson. 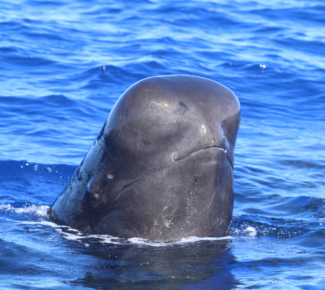 Short-finned pilot whale in the Canary Islands – note the bulbous round head. Photo courtesy of Fabian Ritter/MEEReV. Like Killer whales and sperm whales, pilot whales form stable family and social groups of 20-100 individuals. These groups are based on matrilineal lines – meaning that calves stay with their mothers through adulthood. Unlike sperm whales, young male pilot whales do not leave their maternal group to seek mating opportunities, but instead stay with their maternal group for life. It is thought that males gain the opportunity to mate with females outside their own family groups when multiple pilot whale groups come together in large aggregations2,7. Female pilot whales reach sexual maturity at the age of 8-9 years, while males are a bit later at 12-17 years. Gestation is estimated to be 12 months for long-finned pilot whales and 15-16 months for short-finned pilot whales. Calves nurse for at least three years, and perhaps even longer, even after they have started eating a solid diet. Females tend to reproduce up to the age of 40, but can continue nursing and caring for other females’ calves for up to 15 or 20 years after they stop producing calves themselves2. Males have shorter life-spans, usually living only 35-45 years2. Adult male pilot whales, like this short-finned pilot whale, develop very large and pronounced dorsal fins. Photo courtesy of Paula Olson. Short-finned pilot whale mother and calf. Photo courtesy of Paula Olson. 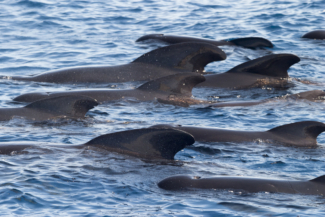 Resident populations of pilot whales, such as those off the Canary Islands, Madeira, and Hawaii can be studied using photo-identification. Individual pilot whales are photographed and recognized over time by the unique nicks and scars on their dorsal fins, allowing researchers to monitor individual’s movements and life histories over time. Scientists also use a host of other research techniques including satellite tagging, acoustics, and genetics to study this species and learn about their long-range movements, population identity and communication. There is no documentation of predators taking pilot whales, although it is likely that killer whales or large sharks target the species from time to time8. Pilot whales are the species most often involved in mass strandings throughout their range, with several well-documented incidents that have given rise to various theories about the cause of mass strandings. These theories include accidents in navigation that lead animals to unexpectedly shallow waters9, anomalies in the earth’s geomagnetic fields caused by solar storms10, or impaired navigation in diseased individuals that lead the rest of the group astray. The latter theory was discredited to a certain extent by genetic analysis of stranded pilot whales that showed that whales that stranded together were not often closely related11. Like virtually every other species of whale or dolphin, pilot whales are susceptible to entanglement and bycatch in fishing gear, and have been documented as bycatch in pelagic drift gill nets, pelagic long lines and some trawl fisheries3. 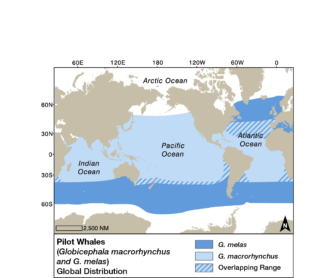 Short finned pilot whales are known to be the subject of bycatch in several fisheries in the North Pacific, the Indian Ocean, and the SW Atlantic12,13. 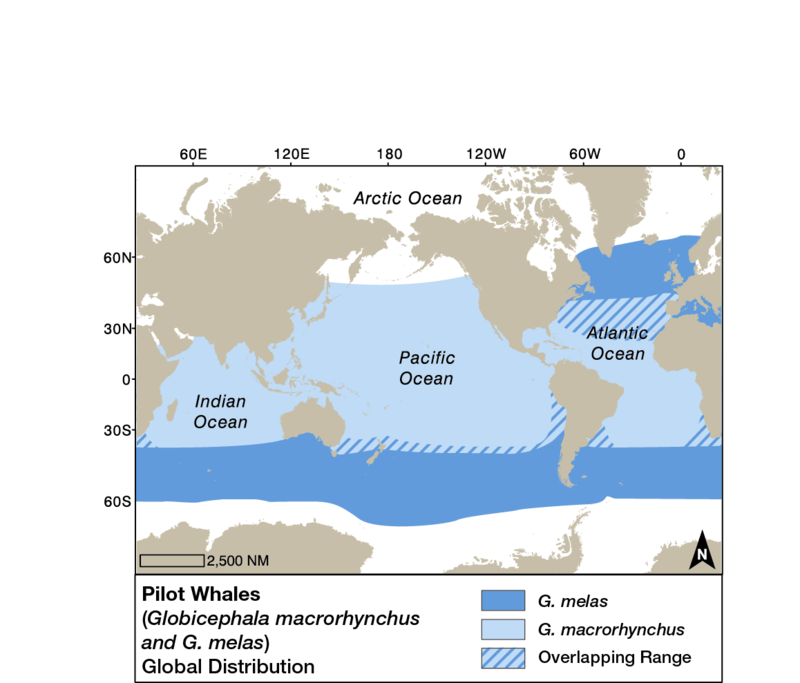 Long-finned pilot whales are also subject to bycatch in various fisheries in the Mediterranean, Atlantic, and off the southern coast of Brazil4. As top predators, pilot whales also suffer from the bioaccumulation of contaminants such as heavy metals and organichlorines contaminants in their tissues3,14, which can may have serious long-term impacts on health and reproduction. Pilot whales’ strong social bonds and herding instincts make them prime candidates for so-called drive fisheries, where they are herded towards shore by many boats and then killed in shallow waters. Long-finned pilot whales used to be hunted this way in Newfoundland (Canada), Cape Cod (USA) Norway, Iceland, Greenland, Ireland, Scotland and the Falkland Islands. Currently the only remaining active pilot whale drive fishery is in the Faroe Islands, although a hunt continues in Greenland as well4,15. 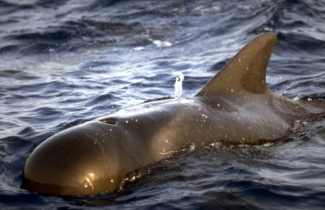 Short-finned pilot whales are hunted in drive fisheries off the coast of Japan, and are also subject to takes off St. Vincent and the Grenadines, St. Lucia, Indonesia and the Philippines12,16-19. Although both Long-finned pilot whales and short-finned pilot whales are abundant in many parts of their range, there is some uncertainty about their taxonomy. It is likely that populations grouped under one species now may actually represent multiple species or sub-species, which would be seriously impacted by some of the known threats in their region. As such, both species are designated as Data Deficient on the IUCN Red List of Threatened Species4,12. Long-finned pilot whales are listed under Appendix II of the Convention on Migratory Species (CMS). 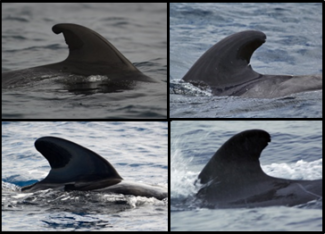 Short-finned pilot whales in the Canary Islands can be recognized by the nicks and scars on their dorsal fins. Photos courtesy of Fabian Ritter/MEEReV. Southern Hemisphere long-finned pilot whales often have a white saddle patch behind their dorsal fin. Note the small gray calf. Photo courtesy of Paula Olson/IWC. 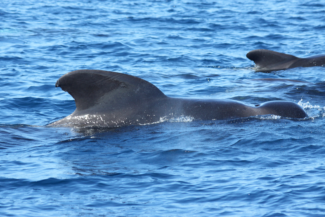 Short-finned pilot whales in the Canary Islands – note the bulbous round heads. Photo courtesy of Fabian Ritter/MEEReV. 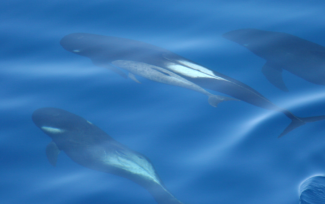 Pilot whales are frequently observed during whale watching tours in Madeira (see Portugal country profile), and the Canary Islands (see Spain Country Profile), which both host resident populations of short-finned pilot whales. Long-finned pilot whales are also often observed by whale watching vessels in the Gulf of Maine USA, while short-finned pilot whales can be observed in Hawaii. Studies examining the impact of underwater noise from whale watching boats found that even those traveling at speeds of only 5 knots have the potential to significantly disrupt pilot whale communication at close ranges20. As with all other species of whales and dolphins, it is of the utmost importance that whale watching vessels adhere to guidelines designed to minimize the impact of their activities on the animals being watched. Whale watching vessel and pilot whales in the Canary Islands. Photo courtesy of Fabian Ritter/MEEReV. Olson, P.A., Pilot Whales, Globicephala melas and G. macrorynchus, in Encyclopedia of Marine Mammals, W. Perrin, B. Wursig, and J.G.M. Thewissen, Editors. 2009, Elsevier: San Francisco. p. 847-852. Olson, P.A., Pilot Whales, Globicephala melas and G. macrorhynchus, in Encyclopedia of Marine Mammals, B. Würsig, J.G.M. Thewissen, and K.M. Kovacs, Editors. 2017 Academic Press, Elsevier: San Diego. p. 701-705. Taylor, B.L., et al., Globicephala melas, in IUCN Red List of Threatened Species. 2008, http://www.iucnredlist.org/det... Consulted on 9 October 2017. Werth, A., A kinematic study of suction feeding and associated behavior in the long-finned pilot whale, Globicephala melas (Traill). Marine Mammal Science, 2000. 16(2): p. 299-314. Cañadas, A. and R. Sagarminaga, The northeastern Alboran Sea, an important breeding and feeding ground for the long-finned pilot whale (Globicephala melas) in the Mediterranean Sea. Marine Mammal Science, 2000. 16(3): p. 513-529. Baird, R.W., False Killer Whale, Pseudorca crassidens, in Encyclopedia of Marine Mammals, W. Perrin, B. Wursig, and J.G.M. Thewissen, Editors. 2009, Elsevier: San Francisco. p. 405-406. Chambers, S. and R. James, Sonar termination as a cause of mass cetacean strandings in Geographe Bay, south-western Australia. Proceedings of ACOUSTICS 2005, 2005: p. 9-11. Vanselow, K.H., et al., Solar storms may trigger sperm whale strandings: explanation approaches for multiple strandings in the North Sea in 2016. International Journal of Astrobiology, 2017: p. 1-9. Oremus, M., et al., Genetic Evidence of Multiple Matrilines and Spatial Disruption of Kinship Bonds in Mass Strandings of Long-finned Pilot Whales, Globicephala melas. Journal of Heredity, 2013. 104(3): p. 301-311. 1Taylor, B.L., et al., Globicephala macrorhynchus, in IUCN Red List of Threatened Species. 2008, http://www.iucnredlist.org/det... Consulted on 9 October 2017. Mignucci-Giannoni, A.A., et al., Cetacean strandings in Puerto Rico and the Virgin Islands. 1998. p. 1-8. Gajdosechova, Z., et al., Possible link between Hg and Cd accumulation in the brain of long-finned pilot whales (Globicephala melas). Science of The Total Environment, 2016. 545-546: p. 407-413. NAMMCO. Report of the Meeting of the Management Committee for Cetaceans, March 2018. 17 (North Atlantic Marine Mammal Commission Tromsø, Norway, 2018). Kasuya, T. Small Cetaceans of Japan: Exploitation and Biology. 476 (CRC Press, 2017). Fielding, R. & Evans, D. W. Mercury in Caribbean dolphins (Stenella longirostris and Stenella frontalis) caught for human consumption off St. Vincent, West Indies. Marine Pollution Bulletin 89, 30-34, doi:https://doi.org/10.1016/j.marp... (2014). Emont, J. in The New York Times Vol. https://www.nytimes.com/2017/08/03/world/asia/whaling-lamalera-indonesia.html Onlne (New York, New York, 2017). Mustika, P. L. K. Marine Mammals in the Savu Sea (Indonesia); indigenous knowledge, threat analysis and management options BSc(Hons) Thesis thesis, James Cook University, (2006).